Roger Federer, whose sporting success and personality have made him a household name both in Switzerland and abroad, is an ideal ambassador for his homeland. Indeed, Federer, who grew up in Basel, near the border with Germany and France, is also a globally minded individual. This is especially true as his mother, Lynette, comes from South Africa, and he therefore grew up in different cultural and linguistic worlds. 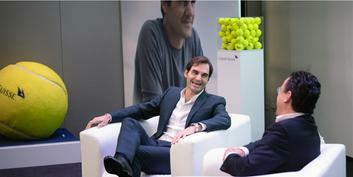 Roger Federer is also an ideal global ambassador from Credit Suisse's perspective. Shared values such as the pursuit of excellence and strength of purpose make him a sought-after partner for the long term. It is therefore intended that his partnership with Credit Suisse will extend beyond the end of his sporting career. Roger Federer is respected for being one of the most accomplished athletes ever and he is one of the most admired icons in the world today—not only for his achievements on the court but also in his philanthropic work and his foundation. The attributes Roger represents are 100 percent aligned with who Credit Suisse is as a brand. Credit Suisse shares Roger Federer’s standards and his commitment to delivering an exceptional performance at all times. The bank strives to consistently offer its clients flawless service in order to create long-term security and added value. A relentless focus on clients and their needs has long been a cornerstone of Credit Suisse's business model. In the framework of this partnership, Credit Suisse is also supporting the Roger Federer Foundation (RFF) with a contribution of one million US dollars every year until 2019. These additional resources will primarily be invested in an early years education initiative in Malawi, helping more than 100,000 children. "Early on, my family and I decided that if I became successful in sport, I would give part of my income back to society," explains Federer. "In 2003, I therefore set up the Roger Federer Foundation, which supports education and training programs in South Africa and other African nations, as well as promoting the next generation of sportsmen and women in Switzerland." The cultivation of young talent in Switzerland and the pledge to helping worthwhile causes are two more areas in which Federer's views match those of Credit Suisse. The bank’s commitment to acting as a good corporate citizen was an important argument for Roger Federer in embarking on this partnership: "Credit Suisse has a strong brand and Swiss roots and is one of the world's leading companies while, at the same time, taking its corporate responsibility seriously." The Roger Federer Foundation is involved in early childhood education projects in Malawi. In a documentary series, Credit Suisse provides regular updates on three of the children and other aspects, including how the initiative is progressing. The second episode of the documentary series that Credit Suisse is making about the work of the Roger Federer Foundation in Malawi was broadcast recently. It shows that progress is being made. The third episode of the series "Growing Up in Malawi" shows that the construction of the day care center in Thundu has made good progress in recent months. But in Mbwetu, the center is still struggling to provide food. In the fourth episode of the documentary series "Growing Up in Malawi" we encounter various surprises: The kitchen is now in full use. But the nearby source of water has dried up. The women now have to fetch water from far away. Children are eating spinach and fish with their cornmeal mush at the day care center in Mbwetu. The sixth installment of "Growing up in Malawi" shows how the center afforded this and why drinking water is still the biggest problem. The day care center in Thundu, one year after it opened. Over 200 children come to the center every day. Only the primary school in Mbwetu is causing concern. The seventh installment of the series "Growing up in Malawi" reports. In the eighth episode of the documentary series "Growing up in Malawi," Janet Kuyeli visits numerous daycare centers in the northern region. The bumpy ride ends in tears. Growing Up in Malawi – Episode 9: Report on the Foundation's Largest Education Initiative. The respect that Roger Federer shows his opponents and the public is fully reciprocated: no other sportsman enjoys the same level of goodwill and recognition. For example, in 2008 he was named World Sportsman of the Year for the fourth consecutive year (Laureus World Sports Awards). The consistency of his performance – year in, year out – is impressive. Since Roger Federer first won the Juniors title at Wimbledon in 1998, his career has gone from strength to strength. He won his first tournament (in Milan) in 2001 and has since achieved a string of successes. 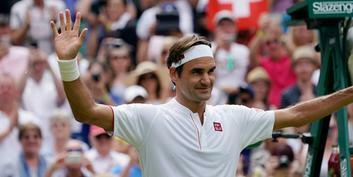 At last count, he had won over 80 singles titles, including 17 Grand Slams, and 8 doubles titles – and no one doubts that his number of victories will continue to grow.